Lord, show me the source of this burnout. Show me why I’m trying to carry so much. Father, help me to lay everything down that I need to lay down. I hope you prayed through these points and asked the Lord for His help yesterday. It’s so important to identify the root cause of any struggle, so we can be healed. Related: This series is complete; read Part 3 (prayers 7-10) here. 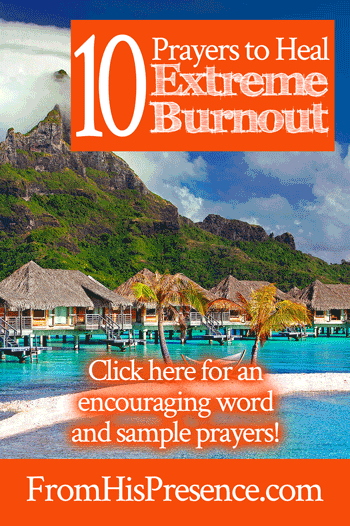 Today, we will pray through the next several prayers to heal extreme burnout. And I know these work, for I have been praying them myself and seeing tremendous results. Glory be to God Most High! Prayer 4: Make Your strength perfect in my weakness. And He said to me, ‘My grace is sufficient for you, for My strength is made perfect in weakness.’ Therefore most gladly I will rather boast in my infirmities, that the power of Christ may rest upon me” (2 Corinthians 12:9). This thing about boasting in our weakness is very real. It doesn’t mean we should go around bad-mouthing ourselves; that would be speaking word curses against ourselves. Death and life are in the power of the tongue, and we eat the fruit of our words. So don’t go around talking about how awful/sick/weak/etc you are. However, we SHOULD confess our weakness and our need to God. THAT kind of praying contains humility. It also contains our petition; our heartfelt request, asking, or “supplication” for God’s help. And when you pray like that, God moves FAST. He responds to humble prayers of faith that claim His promises and ask for His help. So if you didn’t already, stop and pray through prayer #4 (above) for yourself; and be sure to do so out loud, ok? Prayer #5: I’m coming to You, Lord Jesus, for I’m weary and heavy laden. Please give me rest. I have always found Jesus to be true to His Word in every situation, and this promise is no different. I can’t even tell you how many hundreds or even thousands of times I have prayed this promise back to God. “Father God, Your Word says I should come to You when I’m weary and heavy laden, and You will give me rest. So Father God, Lord Jesus, Holy Spirit, I’m coming to You. I’m exhausted, Lord. I’m so tired. And I’ve been weighed down by burdens too heavy for me to carry. Lord Jesus, I choose to lay these burdens down at Your feet. I repent for ever picking them up, for Your Word says that all the works You created for me were finished before the foundation of the world. YOU hold my life in Your hands. YOU perfect everything that concerns me. You answer before I call. I cry and You help me, Father, and You always have. So Lord, I lay these burdens down at Your feet. Please forgive me for trying to carry this load. I repent for failing to rest in You, and I choose to rest in You right now. I choose to trust You. I give You everything that concerns me, and I ask You to give me Your rest. Please fill me with Your holy peace and calm. Calm my soul, body, and spirit. I take Your yoke upon me right now, for You are gentle and humble in heart, and I receive Your rest for my soul. And every time I have ever prayed that, Jesus has immediately given me peace. He has given me rest. It doesn’t take Him days to do it, either. He has always given me rest right as I was sitting there praying. Before praying, I often feel like a balloon filled with tiredness, worry, and sometimes even anxiety. But when I pray as I wrote above and ask for His rest, He deflates that balloon and lets all the worry and negativity out. All the exhaustion flows out of me to each side and disappears, and Jesus leaves me sitting with Him, in His arms or beside Him, in total peace. I can feel the weight of His glory and presence in that place, and I know everything’s going to be okay. 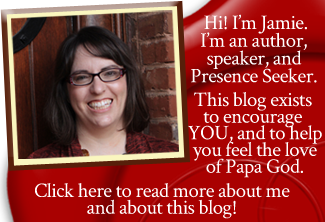 A few years ago, I wrote a song called “Only In My Father’s Presence” (free download here). ‘Cause I have a Father who loves me. I am Your child because You love me. That song was born out of an experience like I talked about above: coming into Father’s presence full of worry, exhausted, and totally depleted … but experiencing His rest as I cast my burdens upon Him. Jesus’ promise is real, and He really will give you His rest. Will you ask Him today? Prayer #6: Help me to sleep well at night. Sleep is crucial to your spiritual life AND your physical life too. You can’t be sharp without sleep, so we need to pray about our sleeping habits and ability to sleep. Unless the Lord builds the house, they labor in vain who build it; unless the Lord guards the city, the watchman stays awake in vain. It is vain for you to rise up early, to sit up late, to eat the bread of sorrows; for so He gives His beloved sleep” (Psalm 127:1-2). “My son, let them not depart from your eyes — keep sound wisdom and discretion; so they will be life to your soul and grace to your neck. God promises to give YOU–His beloved–sleep. If you aren’t sure if you are His beloved or not, read 1 John 3:1-2. You ARE Father’s beloved if you have made Jesus Christ the Lord and Boss of your life. And since you are in Christ, you can have all the blessings He has promised to His people–including SLEEP. It’s been a long time since some of you have slept well. For whatever reason, sleep has eluded you. But you know what? God’s Word promises that YOU can sleep well. So I encourage you to look up all His Scriptures about sleep (there are more than I’ve listed above), write them down, pray them back to God every day, and take communion over them. Confess those Scriptures out loud with your mouth over your own life. God’s Word always works! “Father God, in Jesus’ name, thank You for promising to give me good sleep. Father, I need good sleep this night, so I am lifting Your promises back up to You. Father, You promised in James chapter 1 that You would give me wisdom if I ask for it. So, I am asking. Please give me wisdom and discretion. Help me to keep and maintain them. When I lie down, help me not to be afraid. Fill me with Your perfect love when I lay down and when I stand up, and Your love will cast out all fear. Father, thank You that my sleep shall be sweet. Please remove the barriers and hindrances that keep me from sleeping well. Help me to use the wisdom and discretion You give me to change any habits that interfere with my sleep. Help me to surround myself with a peaceful, calm environment that is conducive to sleep. Help me to cast my cares upon You each and every day, so that I will not worry and I’ll dwell in peace. Father, You give blessings to Your beloved in sleep. Your Word says that I am Your beloved, so I humbly claim Your promise. Please bless me in my sleep. Bless me WITH good sleep, and encounter me in dreams and visions as I sleep. Send Your angels to minister to me this night, and help my sleep to be deeply restful. Father, I commit the night seasons to You. As I sleep, please speak to me. Help me to rest in Your arms. Help my heart to meditate on You and Your precepts even while I sleep, and help me to wake up beholding Your form. Praying through these Scriptures about rest will transform your life and soul when you’re struggling with burnout. Are you praying through these prayers with me? Can you sense Father working in your heart to give you rest as you pray? If so, leave a comment below–and check back in the next blog post for the last 4 prayers to heal extreme burnout! Thank you so very much for these prayers! I didn’t realize how burned out I truly am. I started praying these and I can feel God’s presence. So glad the prayers helped, Brenda. I’m sorry you’ve been going through a hard time. I’ll pray for you right now. Thank you Jamie. I now have a prayer to help me get a blissful sleep. I have been staying awake most often times. I believe this is going to be the end of my burnout in Jesus name. God bless you. Thank you Father God, and thank you Jamie! I now have a prayer reference I can speak over myself to receive Shalom Peaceful Rest…. The prayer for a good nights sleep is awesome. I have only been praying it for a few days, but I have noticed a big difference. I have been waking up a lot more rested and that makes a big difference in my day. Thank you for posting these prayers! God bless you and your family!